One of the challenges associated with retirement planning is the level of uncertainty associated with trying to plan 30 or more years into the future. How long you will live, how much of that time you will be able to live independently, future market performance, inflation rates and tax policy will all have a profound impact on your financial future. However, the cost of health insurance and health care at the beginning of retirement may be one of the greatest concerns for those planning ahead. Medicare coverage typically begins at age 65. Those enrolling for Medicare face important decisions and sometimes confusing options when they enroll. The challenges are even greater for those that plan to stop working full time before they become eligible. Medicare- At the time of retirement, or upon attaining age 65, most people will sign up for Medicare part A. Medicare Part A provides basic hospital insurance and does not require an additional premium. Most Medicare recipients will also sign up for Medicare part B, which provides more comprehensive medical coverage for office and specialist visits, medical equipment etc. Typical medicare advantage plan. Medicare Advantage plans may or may not require an additional premium. Advantage plans replace Original Medicare with an HMO/PPO model and network coverage. Medicare Part A and Part B on their own function somewhat like a high deductible health plan. When accessing medical services, you may be left with substantial co-pays and deductibles. The majority of consumers will add supplemental/ prescription drug coverage or enroll in a Medicare advantage plan. Depending on preferences and anticipated medial expenses, there are a broad range of options that may make sense. However, most people are able to budget a set amount for monthly premiums, co-pays and deductibles knowing their actual costs will likely fall into a fairly narrow range. Many Medicare beneficiaries are comfortable budgeting $350-$500 month for premiums, co-pays and deductibles. If you retire before 65 and cannot continue your employer coverage or access coverage through your spouse… you may be in for some sticker shock. A surprisingly appealing option in many cases is COBRA. If you have good coverage through your employer, in most cases you can keep it for 18 months after retiring. If your employer subsidizes the cost while you are working, you will most likely lose this subsidy once you are retired and have to pick up the full tab. This may still be much better than the alternative of purchasing coverage on your own. Most large employers self-insure their company plan. This means the risk pool you are in is made up of co-workers and generally include a relatively young and healthy subset of the population. This tends to lessen the risk to the employer of facing numerous large claims, bringing down the net cost of insurance for employees. In most cases, the only alternative currently available for individual health insurance is through a state exchange. In Minnesota, MNSure, serves as the central repository to compare plans from different carriers. You can request assistance through a MNSure qualified navigator or you can compare prices and plans on their website. 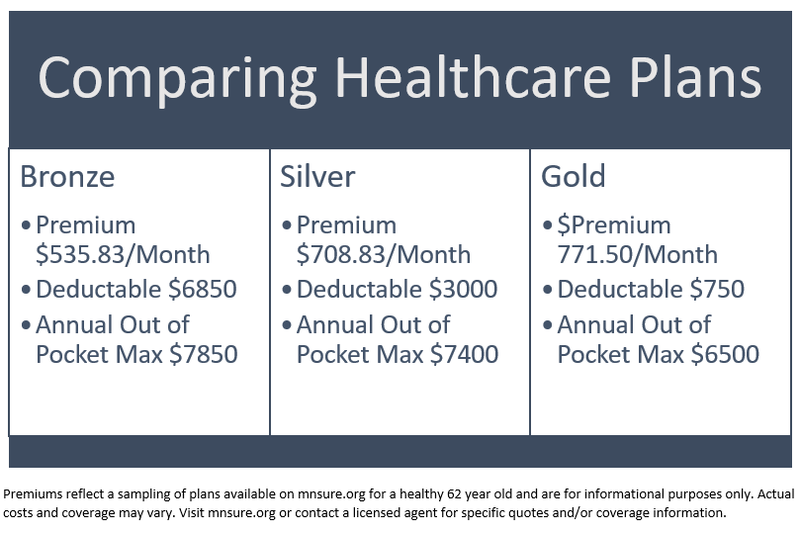 While you may choose different levels of coverage, in general, most of the plans will have deductibles that apply before the plan pays for anything. These plans are often much more expensive and provide less coverage than the generally robust employer plans. As a general guideline you may need to budget as much as $1000 to $1500 per month (or more) per person to cover your insurance premiums and deductibles. See chart/info above. Those who have to obtain their own coverage for several years before enrolling in Medicare face additional challenges due to staggering costs and must deal with the uncertainty of what it will all look like tomorrow. While this is a hot button issue, nobody seems to know how to make these costs more affordable. In some cases, it may be possible to arrange your sources of income so that you qualify for a state or federal subsidy. Eligibility is often determined based on current and future taxable income. If your income falls below certain thresholds, you may qualify for subsidies to reduce the cost of insurance premiums and/or co-pays and deductibles. You may be able to begin receiving subsidies based on the estimate of the income you provide. However, if upon verification, your actual or future income is greater, you can be retroactively billed for subsidies you received but did not qualify for based on your actual income figures. Despite the repeal/removal of the individual health insurance mandate, healthcare cooperatives continue to expand as an alternate to traditional coverage. Many of these plans gained popularity because they exempted participants from penalties for not carrying qualified coverage as mandated by the Affordable Care Act. While these plans are not considered insurance and may provide little or no coverage for routine services, they may provide some relief from major/catastrophic medical costs. Because of the limited coverage they offer, these plans generally carry comparatively low premiums. Many of the organizations that sponsor these programs are tied to religious organizations and may require affiliation with that group. Many prospective retirees express a desire to continue working after their official retirement, but in a reduced (different) role. While many employers only offer benefits to full-time employees, it may be worth seeking out one of the organizations that offers health insurance and other benefits to part-time staff. Not only do most employers that offer health insurance subsidize a portion of the premiums, many of the larger group plans offered by employers offer comparatively generous benefits at lower premiums than individual plans. In recent years, politicians have offered proposals aimed at expanding access for individual plans with the goal of reducing costs. Even if changes are made the impact and timing of any future changes is a complete unknown. Because of this and other factors that drive the cost of care and insurance, there is no way of knowing whether costs will continue to increase much faster than inflation, stabilize, or even decrease over time. For now, the safe advice for those that need to purchase coverage on their own is be prepared to pay a lot now and possibly even more in the future. How long you will live and in turn how long you need to plan for. If, when, and how much long term care you may require. How well or poorly the stick market will perform during your retirement and the sequence of those returns. What the rate of inflation will be. How much you will pay in taxes. Once a retiree reaches age 65 and is eligible for Medicare, the cost of medicare, supplemental insurance, and out of pocket expenses are reasonably predictable. Those retiring prior to age 65 face much more uncertainty as to where and how to get health insurance coverage and how much it’ll cost. While this will only be temporary based on current plan offerings a premiums a short period of having to buy your own coverage can have a lasting impact on your overall financial picture.